[Ramadan Series] How to Organise a Productive Iftar Party! As the guests arrive, meet each other with warmth and spreading the greetings of Paradise without letting the kitchen overtake! Instead of spending this time in idle chit chat – present your guests with a copy or translation of the Qur’an, or play the recitation of the Qur’an before iftar and encourage everyone to make personal dua as it is a special time in which duas will be accepted – hopefully you will be in their supplications for providing such an amazing iftar party. At the adhan – recite after the muaddhin, then hasten to break your fast. Give your guests dates/milk/water beforehand to ensure they open their fast following the etiquette of the Sunnah. Avoid presenting large starter platters at this stage as they can be a distraction from rushing off to Salah. Save tucking into the food for after Maghreb. For brothers, walk/drive to the nearest mosque and offer your Salah there. Even if your guests are not accustomed to praying Maghreb in the mosque or on time during Ramadan; they will usually follow you. For sisters, take this opportunity to pray in congregation. Once done with Salah, don’t seem rushed and take time to pray the Sunnah prayers after Maghreb, again your guests will follow. The BIG moment! Ok, ensure there are plenty of healthy options, and try to include the super Sunnah foods such as olives, cucumber, melon, etc on the table. To share the reward of feeding fasting people, you may ask your guests to bring a small dish with them as well. 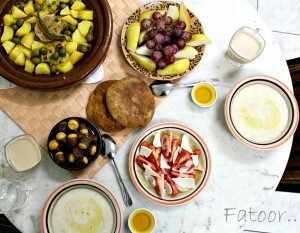 (Organise it well, so you avoid an all-sweet or all-salty iftar meal!). Take the lead as the host in saying “Bismillah” before your meal starts, “Hamdulillah” after your meal, and setting the example of not over-eating but eating with moderation. Ah, my favourite part of the iftar meal! How can you miss the famous tea time? This is the time of super interesting discussions since people are well-fed and relaxed. Make sure you steer the conversation here to productive talk, or at least talk that doesn’t include any backbiting, lying or foul language. Again, as the host, if you take the lead in the discussion, your guests will learn by example. One ‘must have’ activity for your party is fundraising for a noble cause. You could even save the dessert cake and get a charitable bid going on who gets the first slice! Fundraise for your local masjid, for a widow/orphan you know, or for our brothers and sisters in Somalia. (Note: Out of courtesy, make sure you mention to your guests before they arrive that there will be a small fundraising after the iftar meal, this way they come prepared with cash). Too often, large iftaar party meals make people culprits of missing taraweeh prayers as we become lazy from over-eating and we find it impolite to rush off our guests from our homes to pray taraweeh. Again, you need to take the lead here: Inform your guests that you’ll be going for taraweeh and hope all of them can join you, and mention that the party is not over yet! There’s more after taraweeh prayers! Whilst you go and prepare yourself for taraweeh, make your guests feel at home if they need to use the bathroom or refresh their wudhu, also offer them miswak and some nice ittar to get ready with. When your guests are leaving, take this opportunity to thank them for accepting this invitation and supporting your cause during your little fundraiser. Ask them to make dua for you and here’s a top tip – never let the guests leave your party without goodies! You can give them dua books/CDs/ittars or any small memorable gift they’ll remember you with. This will sure end the party on a beautiful note bithn’illah. P.S. – We would love to hear from you if you will try the above plan. Also, feel free to share with us any other ideas to make your Ramadan iftar party super productive!